Archaeologists believe that ancient objects can make the greatest contribution to our understanding of the ancient world if information about their findspots is preserved and made public. The proposed MoU is one tool that will help preserve knowledge about past societies. But it is extremely important that the voices of professionals and enthusiasts alike are heard. If we do not write, the committee considering Greece's request cannot know what we think. If you would like to submit comments, go here and click on "Submit Comment". 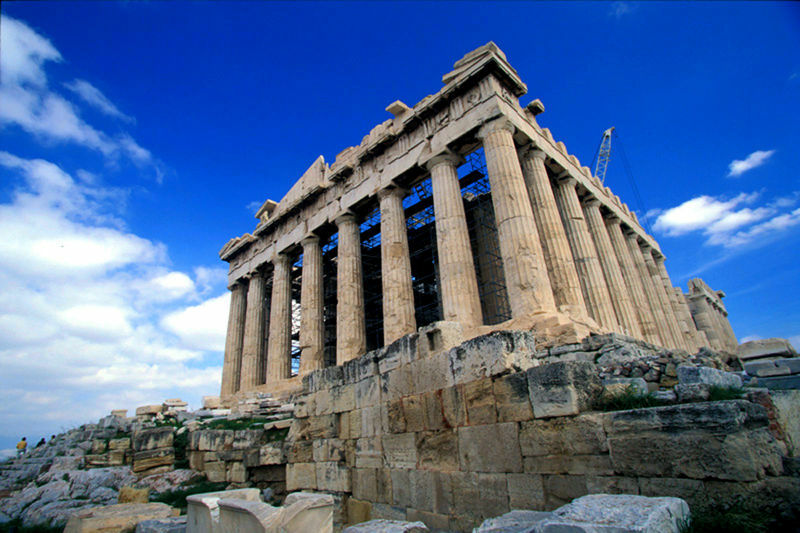 If you would like help with what to say, go to the AIA's page of information about the Cultural Property Advisory Committee, the body that will make the initial recommendation as to whether or not to enter into an agreement with Greece. It is very useful to look at the four determinations that the committee will use. It is important to note that Greece's archaeological heritage - including coins, ceramics, sculpture and other objects - is under threat. If you would like confirmation that this is the case, you can read David Gill's blog "Looting Matters". His recent post "Protecting the Archaeological Record of Greece" lists earlier posts that demonstrate the damage that illegal excavation and import has done to our understanding of Greece's rich past. We also courage readers to join AIA's letter writing campaign. By all means, the historical sites should be preserved. I can empathize with collectors and amateur historians about the cost or difficulty it may be to obtain a piece of history. There is just something about being able to savor a small window into the past. What I can't comprehend is how some people can put a price on history, or be against something that is trying to protect the archaeological record, process, and integrity of a nation. Just because someone wants something, doesn't mean they should have it if it is obtained illegally or through shady means. The main idea behind a MoU is to give the past a fighting chance and for that country to be able to protect it's very foundations. Shame on people for being selfish by only wanting an item just for themselves. History is meant to be shared, or how else will we strive to not repeat it? Greece especially has an important historical influence on America. I would bet that Socrates, Aristotle, and Homer would be appalled that not protecting a people's archaeological heritage isn't a priority for the majority. I would like to be considered a small voice of support in a large sea of controversy. Please grant Greece a MoU so that their future can learn about their past. Your Grecian past is for everyone on this planet--please help to preserve it!! Greece has a rich history dating back thousands of years. Preserving the Greek monuments will help us to learn how the world has become the way it is, attract tourists and contribute to the Greeks cultural pride. Without these monuments, part of the ancient world will truly be lost as they are irreplaceable. Please preserve these monuments for the benefit of Greece and the world. The SAFE page linked in the prior comment, and here, is excellent and I encourage everyone to read it. These sites must be preserved regardless of the cost.......once they are gone, they can never be replaced. This is about preserving not just Greece's history but our own foundation of our civilization. These cultural antiquities belong to humanity. Everyone today owes a level of respect to these important sites. We all are inheritors of this treasure. The world would be a sadder place without this history to see, to touch, to behold. I am glad to be a member of your group. It has come to my attention that Greece has asked on her own part for the United States of America to establish a bilateral agreement to protect her archaeological heritage by putting restrictions on Greek cultural property, upon the date of October 12th 2010. I am a student from Ponoka, Alberta and take pride in the Greek history that surrounds our daily lives in literature and studies. I have always been interested in the Greek forms of writing and how they lived through out the centuries. It would also be amazing to study and visit the great sanctuary of Delphi, to study how the oracle found their mystic powers and how the Greeks decided that it was the center of their world to see something like that in a life time is life changing. So by introducing the MoU to the public it would increase the awareness of information from Greece and her artifacts. I believe that this is crucial for the sake of preventing the past to being misinterpreted by those who do not fully understand the whole of Greek history and her artifacts. In conclusion I respectfully ask the Committee to go forth with the establishment of this agreement in the form of a Memorandum of Understanding between the Government of the United States of America and the Government of Greece. It is a disgrace that the USA has not entered into an MoU with Greece on this matter. I hope it does the decent thing as soon as possible. Delphi is a beautiful city, with lots of sights to see, like the oracle of Delphi, all the temples, and the beautiful artefacts. It is important as it is part of our history, and holds the backstories to so many myths and legends. Medusa, cyclopes, minotaur, giants and gorgons, all those feared monsters, have evolved from Greece. So have so many of our childhood heroes, like Pegasus, Achilles, Perseus, and Jason. All the zodiac signs, and all the planets are from Greece. Surprised? Delphi has a rich history, dating back thousands of years. Preserving all those monuments will help us and our future generations learn about how the world has become the way it is, attract tourists, thus increasing income, and contribute to the Greeks cultural pride. Without these monuments, part of the ancient world will be truly lost as they are irreplaceable now. Delphi is thoroughly important, as it is, to the Greeks, the center of their world. The Oracle of Delphi, and their mystical powers intrigue so many, and the pure beauty of this city is outstanding. Greeks have a right to be able to see and touch their ancestors things, and be proud of how beautiful their country is. Also, if we do not preserve these artefacts, the history of Delphi will risk being mis-interpreted by those who don’t know much about it’s history, or even worse, forgotten. We absolutely cannot risk this, as our future generation needs to be able to experience and learn all about the beauty and nature of Delphi,as we have had the luck to be able to do.